Old timers (and those who watch TVland and other classic/retro programs) remember the theme song from Gilligan's Island. It was a tricky little tune, because it had two endings, and you had to know if it was an early episode or a late episode in order to get the ending right. 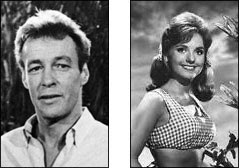 The later version of the theme song rattled off the entire cast, so the line "The professor and MaryAnn" was included. The earlier version, however, just ended with "and the rest" forever condemning the nerd with his coconut radio-phone and the island's cutest pie maker to a life of obscurity. For those of you dying to be in the know, there is an explanation concerning the change of lyrics here -- but honestly, I'm not going to research this, so you'll have to either believe it or chalk it up to normal Internet nonsense. Either way, I'm good with it. At the moment I'm surrounded by and the rest, and not at all in a good way. This and the rest arises out of necessity, because it would be an impossible task to try to name all the leftover things that have found themselves homeless. So I have and the rest piles EVERYWHERE. Sadly, I'm not going to have many options here as time goes on. I'll either have to go through it and make a decision to keep, to toss or to donate, or, I'll have to buy a couple of flamethrowers and arm the cats for the afternoon. Sadly, since they are lacking opposable thumbs that idea isn't going to work out too well, and I'm back to having to go through it all bit by bit. This is the downside to cleaning and renovation. Once a space is cleared, the real temptation is to fill it all back up again as soon as possible, as if the most important thing in this world is to equalize the negative clutter pressure that formed during the cleaning. I'm trying very, very hard NOT to fall into that trap. Besides, when is it enough? I think it many areas of personal aquisition, I'm not only there, I'm well stocked into the next century. This plan for this winter is the purge of 2009. That way (hopefully) when I'm done, I won't be surrounded and suffocated by and the rest . It will be hard making choices of what to keep and what to pass along, but it's time. It's past time. I just wonder if the professor could build me a coconut-powered flamethrower to give me a bit of a helping hand. I abhor 'the rest' when it comes to cleaning and rearranging, because it usually means it's things that I can't quite bear to part with, but have no place in the new scheme of things. Best of luck with your 'rest'. hmm - left a comment which disappeared into cybernowhere. Was saying that, oddly enough, my breaking, entering, and pillaging of my stuff two years ago continues to impact my thoughts about stuff and the rest, especially the transitory and temporary nature of possession. oh, and that thing about lay not up for yourselves treasures upon earth, where moth and rust doth corrupt, and where thieves break through and steal.